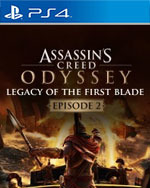 Downloadable ContentThis content requires the base game Assassin's Creed Odyssey in order to play. Shadow Heritage delivers more of the formula set out in episode one: a new villain and a few new tools to continue pulling at the threads of a larger story. Though there are less details concerning assassins and templars in this naval focused chapter, engaging moments and character reveals punctuate another good portion of Odyssey. Shadow Heritage is another fine addition to Assassin's Creed Odyssey. It's an improvement over the previous episode thanks to more engaging quests and better character interactions, but for a game that likes to remind us that player choice is a key part of the experience, the forced ending of Episode 2 is undeniably disappointing. Still, we're looking forward to seeing how it all wraps up in the third and final instalment.